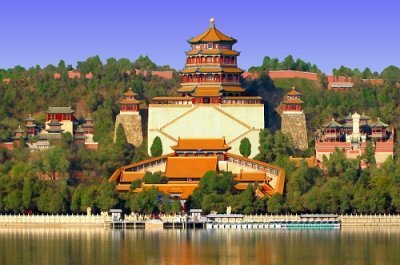 The Summer Palace (Yiheyuan)in Beijing is located on the outskirts of the city, about 12 km (8 miles) from the city center. The Imperial Summer Palace is on UNESCO's World Heritage List. Beijing's Summer Palace is actually a parklike imperial retreat spread out over 10 square miles (30 sq km). Much of it is covered by Kunming Lake. We visited the Summer Palace our first morning in Beijing, and it was an excellent introduction to Chinese history, architecture, and garden design. The palace was originally designed as a royal retreat from the summer heat of Beijing and the Forbidden City. The last dynastic member to use the Summer Palace was the notorious Empress Dowager Cixi, who lived there from the late 19th century until she died in 1908. Find more The Summer Palace images in the gallery of Photorena.